Retroreflective highway signs and lane markers use special kinds of paints and materials. Mostretroreflective paints and other pavement marking materials (PMM) contain many thousandsof glass beads per square foot that are bonded to the highway with a strong binder. Insteadof scattering light, as normal paints do, retroreflective paints containing glass beads turn thelight around and send it back in the direction of your headlights. Figure 3 portrays how glassbeads perform retroreflection. For beads toretroreflect light, two properties are necessary:transparency and roundness. Beads made ofglass have both of these properties. The need fortransparency and roundness can be seen to beimportant if you follow the path of light as itenters a bead embedded in an applied roadwaymarking. The glass bead must be transparent sothat light can pass into and out of the sphere. Asthe light ray enters the bead it is bent (refracted)downward by the rounded surface of the bead to a point below where the bead is embeddedin the paint or PMM. Light striking the back of the paint-coated bead surface is reflected fromthe paint surface, with only a small fraction of the light going back toward the illuminationsource. The glass beads are applied to pavement marking materials in one of three ways. Theycan be premixed in marking materials before application, or they can be dropped or sprayedinto the wet paint directly behind the paint sprayer, or a portion can be dropped ontopremixed two-part epoxy or thermoplastic materials. The top surface of beads is envelopedby the paint, with the wicking action of the paint rising up to above the midpoint of the bead.This provides two actions. It locks the glass beads into the paint and allows the paint to act asa diffuse reflecting surface for retroreflection, with the paint color affecting the color of theretroreflected light. The light entering the glass bead is bent and focused towards the back ofthe bead and reflected back out towards the headlights and driver. A good application ofbeads results in the top layer of glass beads being embedded to about 60% of the diameter ofthe bead. 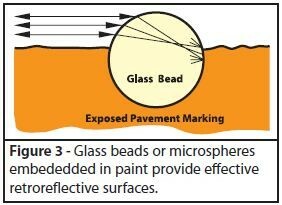 There should be consistent quality of both glass beads and paint so that the paintthickness and bead coverage promotes even retroreflectivity across both directions of roadtravel. Too little paint results in under-embedded beads. This will result in improperlyanchored beads that will fall out prematurely, and thus will not be effective retroreflectors.Under-embedded beads cause a large percentage of the light that enters them to exit out theback. Too much paint results in over-embedded beads. While over-embedded beads mayremain in the binder, light cannot enter them and thus no retroreflection can occur. The bead's Refractive Index (RI) is an important physical parameter. The higher the RI of thebead and the fewer impurities in the glass material, the more costly it is to manufacture. The RIis a function of the chemical makeup of the beads. The higher the RI, the more light isretroreflected. Beads used in traffic paint commonly have a RI of 1.5. There are some 1.65 RI5Figure 3 - Glass beads or microspheresembededded in paint provide effectiveretroreflective surfaces.beads used with thermoplastics, and 1.9 RI beads are often used in retroreflective airportmarkings. Despite the increased brightness gained with the higher refractive index, most stateand local highway agencies find it is more cost-effective to use 1.5 RI beads. 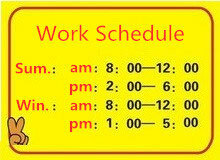 • Uncertainties in material control: there is always some spread in the size of beads in anyproduction run. • Drying time of the marking material (affects settlement of beads in to the binder): adistribution of sizes assures that some of the beads will have an optimum binding in themarking material. • Uncertainties of weather control: another factor affecting drying time. • Service life requirements: as the pavement marker wears, beads that were too deep inthe binder will increase in their retroreflectance ability. • Number of beads applied: a mix of sizes increases the possible coverage.